Newborn Lifestyle portrait taken in his baby's home in Upper St Clair, Pittsburgh. 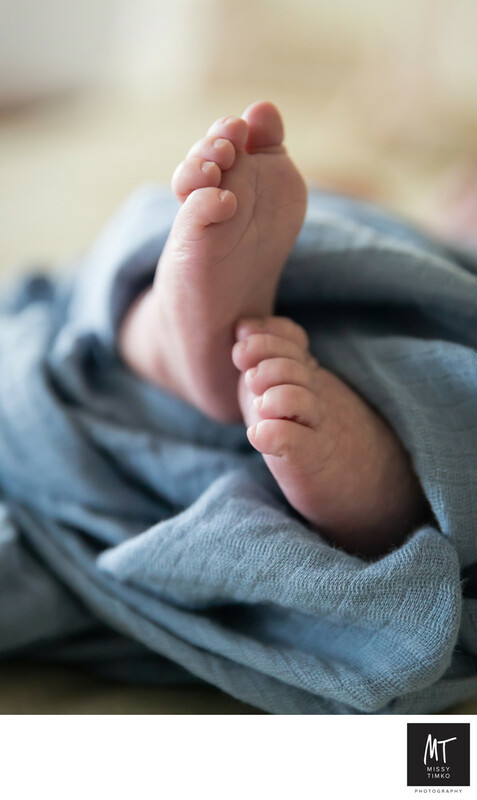 Whatever you choose to dress your baby in for their newborn photography session, just keep your baby’s feet uncovered so we can capture an image of their tiny newborn toes! If they are swaddled we can arrange their swaddle blanket so those cute tootsies poke out the end. In this portrait we captured this babies teeny newborn toes, that will never be this tiny again. Before you know it he'll be kicking off his giant, stinky sneakers after basketball practice and you'll be glad you captured this moment showing just how small and delicate he used to be. Location: Upper St Clair, Pittsburgh.